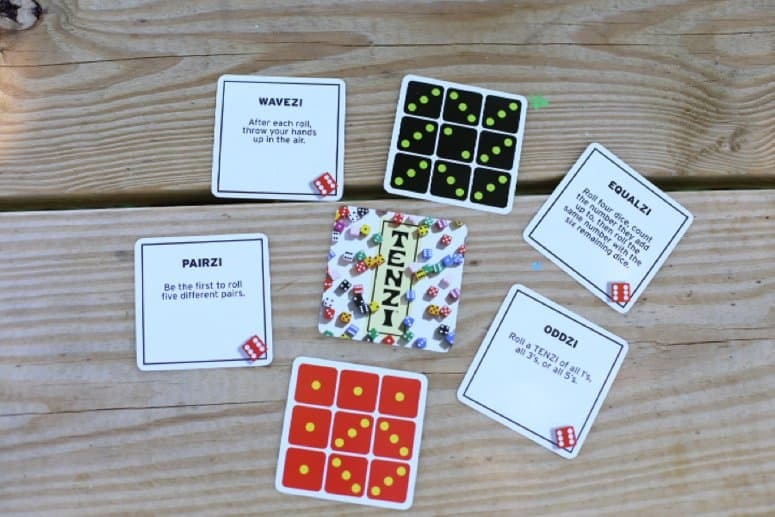 It’s no secret that my family loves to play games together, so we jumped at the chance to review the Tenzi Game and Card Deck from Timberdoodle. 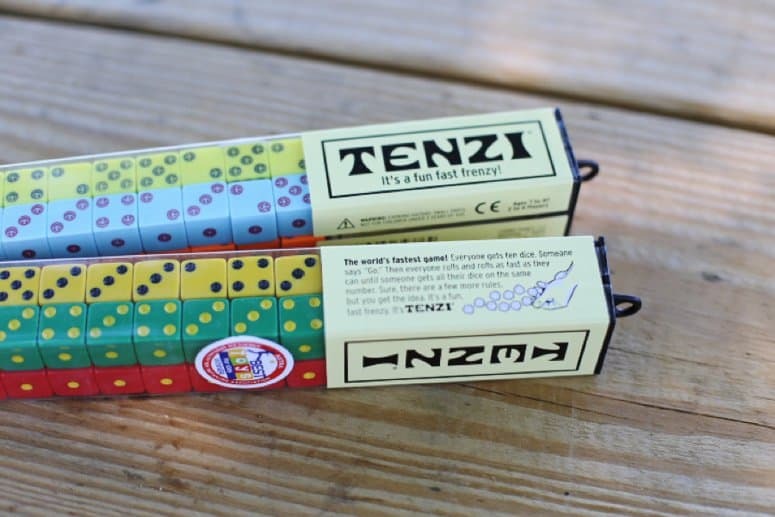 Tenzi is a fast-pasted dice game that can be played at nearly any age. And when I say any age I mean it! This is the one game almost all of my family can actually play together. Even 5 -year-old Emily understands and enjoys the game. And my two-year-old loves to choose his own set of dice to roll as we play. Even though he can’t follow the rules, he feels included and has a fun time. 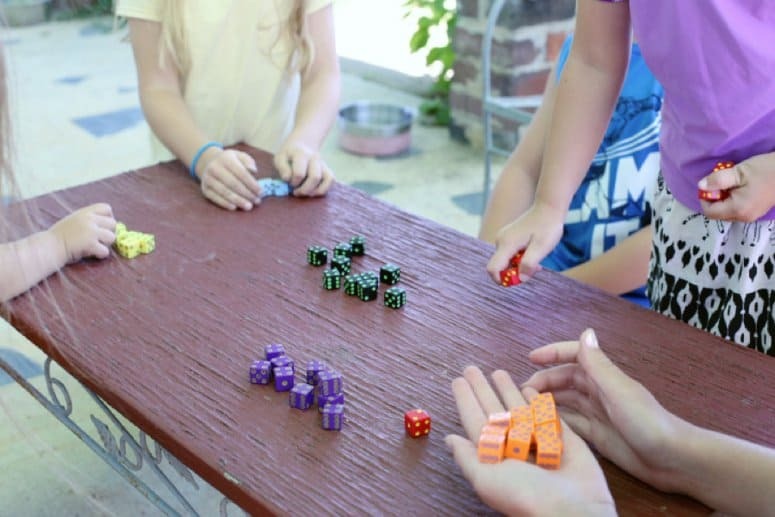 Each set of Tenzi dice allows 4 people to play the game. 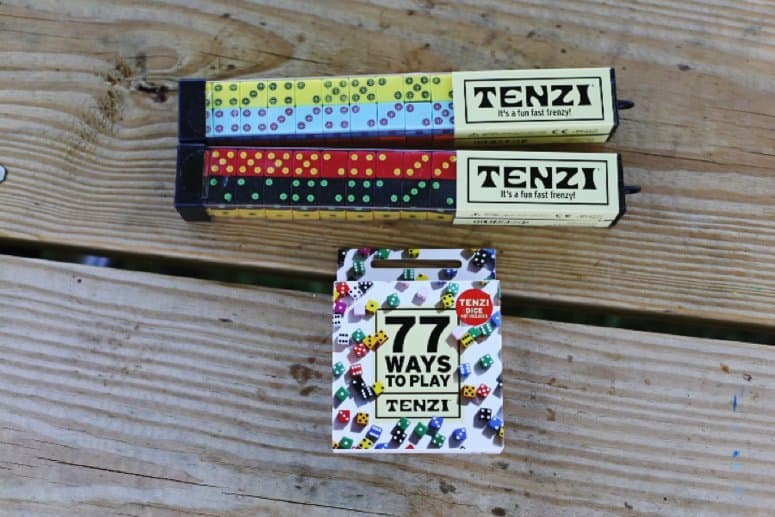 If you want more players, just add more sets of Tenzi dice for unlimited players! I love that with just two Tenzi dice sets my whole family can play. No need to take turns. This game is deceptively simple. 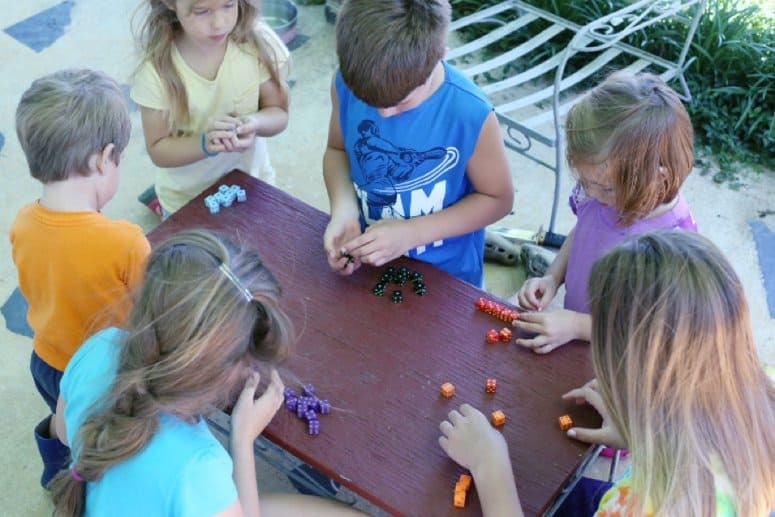 Each player tries get all 10 of his or her dice on the same side. 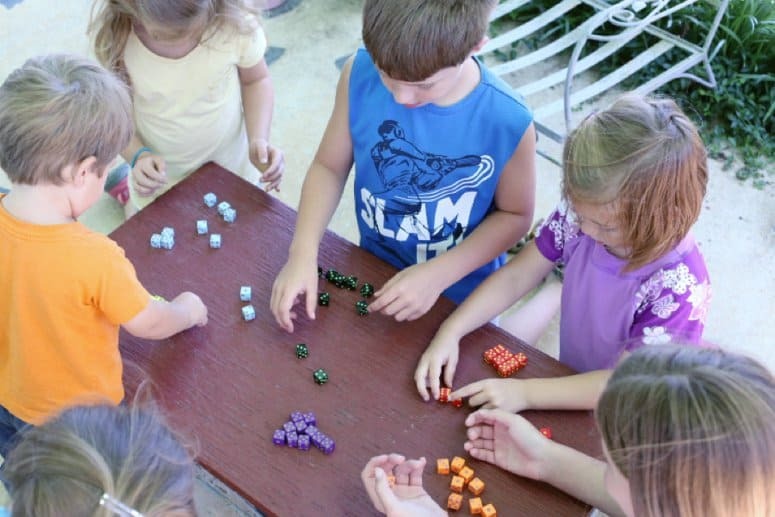 Simply roll all 10, and continue rolling the non-matches until all the dice show the same number. Race to see which player matches all 10 first. It’s also addictive. The rounds are quick and fast paced, but good luck stopping after just a few. I can’t count the number of times we said, “Just one more round!” but didn’t follow through with stopping in the last weeks. You definitely don’t need the card deck to enjoy Tenzi, but it adds an element of adventure and fun for sure. The cards change up the rules, and each player tries to collect the most cards. 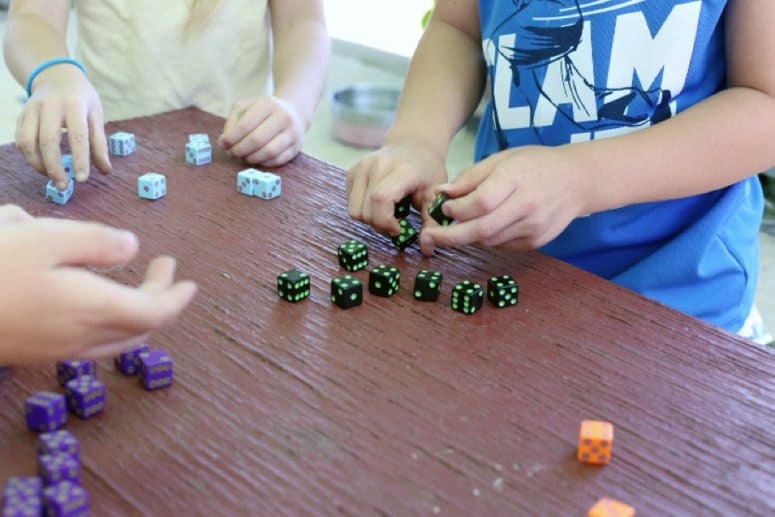 Cards give alternative challenges, such as creating a specific pattern with the dice, rolling even numbers, or completing a funny action between rolls. Another really great thing about this game is its size. The dice take up little room on the game shelf. They are easily tossed in a suitcase for vacation. You don’t even need a table to play, which is great for traveling. Players can just as easily sit on the floor or sidewalk as at a table to play. If you’ve never played Tenzi, you really are missing out! This is one game that has earned a space on our game shelf and in my go-to gift ideas file.